Experienced and professional, warm and caring, we treat our residents like family—devoting each day to their comfort, peace-of-mind and good health. We strive daily to make Rosewood Manor a place our residents are proud to call home. Here are a few of the people you’ll meet at Rosewood Manor. 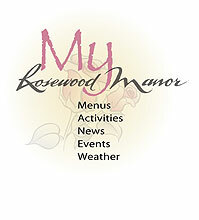 "I began my career in 2003 at Rosewood Manor and have enjoyed every second of it. I consider it an honour and a privilege when we are chosen to care for a loved one. Our team of truly dedicated professionals strive to make Rosewood feel welcoming, homey, fun and place where friendships flourish. A quote I love is “it is not how much you do, but how much love you put in the doing” and we love our residents! " "With mealtime being the focal point of the day for the majority of our residents, it is important to take all concerns very seriously. Quality is a priority for me and I will settle for nothing less than satisfied residents." “I joined the team at Rosewood Manor, April 2016 as a resident service co-ordinator. I had a warm welcoming by staff and residents, everyone made me feel at home. I thoroughly enjoy my job. I get the pleasure of meeting new residents and their family and building relationships with all the current residents and their families. I’m honoured to be a part of their transition and helping write a new chapter in their lives.